Although the Lincoln family continued to migrate west, settling just across the Ohio River in Indiana, Lincoln’s ties with his native state were a constant influence on his life. Lincoln’s lifelong best friend, Joshua Speed, was from Farmington in Louisville, where Lincoln had an extended visit in 1841. 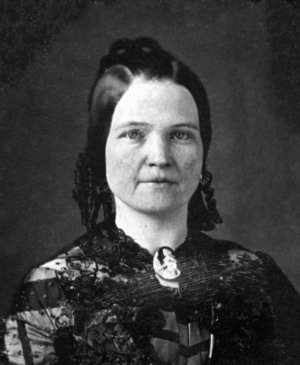 Lincoln and Speed were extraordinarily close, and Speed later recounted that Lincoln “disclosed his whole heart to me.” Lincoln’s wife, Mary Todd, was born and raised in Lexington, and her affluent upbringing represented an important cultural contrast with her husband’s that impacted the couple throughout their marriage. Lincoln developed close relationships with other Todd family members, such as Emily Todd Helm and her husband Benjamin Hardin Helm. Perhaps most importantly, Lincoln’s political idol was the renowned Kentucky politician, Henry Clay, whose political pre-eminence and staunch Unionism did much to influence the sixteenth president’s beliefs and ideals. The intellectual voice of the Whig Party, Clay crafted the party platform of national unity that resulted in the Compromises of 1820 and 1850. He also articulated a model for economic development that added a bold new facet to the nation’s traditional reliance on agriculture and overseas trade. Clay’s “American System” focused on industrial development, federal funding of internal transportation improvements, a high tariff to protect the nation’s industrial development, and a strong national bank to provide a source of investment capital. To a great extent, Clay’s vision was the model for the nation’s economic future. As his political career developed, Lincoln always considered himself a Clay man. It is no coincidence that most of his personal and political Kentucky connections, including his in-laws, were Southern Whigs. As the Whig Party disintegrated in the chaotic decade of the 1850s following the 1850 Compromise, Abraham Lincoln and other northern Whigs migrated to the Republican Party, bringing forward Henry Clay’s dedication to preserving the union. They profoundly influenced the new party’s stance on national unity, economics, and the slavery question that ultimately tore the nation apart. * Interpretive research provided by the Kentucky Historical Society and the National Park Service. All rights reserved.